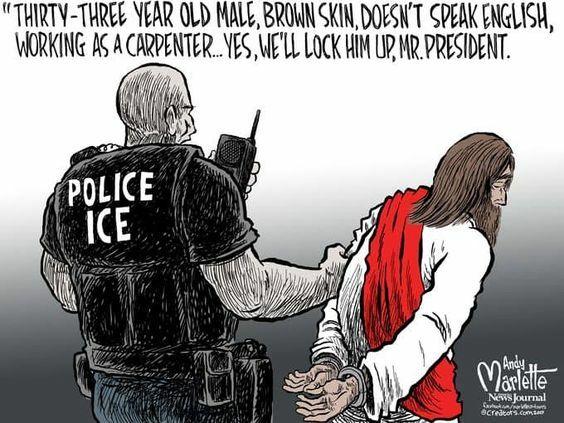 This entry was posted in News & Views, Spirituality & Religious Writings and tagged brown skin, carpenter, Christian, Christmas, church, deportation, Evangelical Right, gospel, ICE, immigrant, Jesus, love, Mr. President, police, praise on December 16, 2018 by Ray Buchanan. Continuing the theme I began in yesterday’s post, I share these quotes from two powerful personalities, both of whom surprisingly share the same view on the subject. As different as these men were, both changed history, and both came to a common understanding that happiness and greatness cannot be separated. True greatness comes from seeking the good of the other. One is “ennobled” according to Marx by focusing on the universal good. As radically diverse as these two figures were, both understood that creating good for those around us, creating happiness in our larger community, is the true path to personal fulfillment. Someone wrapped up in him or herself makes a terribly small package. At least that’s how the old saw goes. Both Marx and Gandhi agree. Fulfillment, greatness and happiness all come from focusing on the welfare of those around us. And in a world where 25,000 of our human family will die today from hunger, we all have abundant opportunities to achieve all three. This entry was posted in Hunger & Poverty, Quotes and tagged community, fulfillment, Gandhi, greatness, happiness, history, human family, hunger, Karl Marx, opportunities, praise, universal good, welfare on April 15, 2015 by Ray Buchanan.